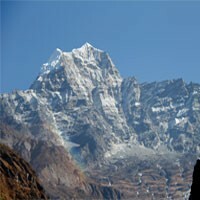 Sirubari homestay is in the west from Pokhara which starts with one day hike from Seti Dovan. 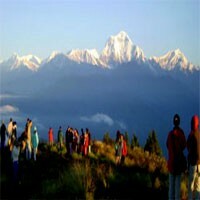 Sirubari homestay tour itinerary covers hike, cultural and traditional experience of Gurung people and their cultural program, typical village experience, and scenic Dhaulagiri/Annapurna/Manaslu Himalayan ranges. Sirubari homestay tour is the first homestay of Nepal. People who would like to stay with locals and discover the lifestyle in Nepalies country site, this Sirubari homestay tour itinerary should be the best. With our arrival in Kathmandu international airport, a representative from Frolic Adventure will greet and takes us to our Hotel with a mode of private transport. We meet a manager from the company here to talk about our trip. Overnight at the hotel. We start our Kathmandu cultural heritage sites tour with an experienced guide and private transport. The guide takes us to Kathmandu Durbar Square, Monkey temple, Pashupatinath and Bouddhanath today and gives a lot of information about the sites, culture, religion, history, and much more than drive back to the hotel. Overnight at the hotel. We drive to the beautiful lake city Pokhara today. We drive by a tourist bus early morning on the Prithvi highway. We drive 200km to Pokhara taking about 6-7 hours than we reach our final destination. After check-in to the hotel, we hang around the lakeside. Overnight at the hotel. Day 04 : Drive to Setidovan by private car/van/bus(2 hrs.) and walk to Sirubari. (6 hrs.). After our early breakfast at the hotel, drive to Setidovan by private transport. and start our hike. Crossing some traditional village on the steep trail, we enter the forest. We have a great view of the snow-capped mountains, valleys, edges, waterfalls, green hills, and much more along the hike. We reach the Top from where we see our destination Sirubari and walk another hour to the homestay village. Overnight at the homestay. Day 05 : Visit view point enjoying the cultural stay at Sirubari. We would be divided to stay in the different homestay houses with our first arrival so we meet in one place this morning and hike to the viewpoint to see the stunning view of the Himalayas after our breakfast which takes about 2 hours. After viewing the view from here, we hike to Dahare Deurali another two hours and come back to the homestay. We have a cultural program this evening which is according to the Gurung dance and songs. Overnight at the homestay. Day 06 : Trek from Sirubari to Naudanda and drive back to Pokhara by private car/van/bus. We have the traditional breakfast here and hike back to the place from where we had started our first-day trek. Private transport will be waiting for us to take back to Pokhara. Overnight at the hotel. Day 07 : Drive to Sarangkot for the sunrise and Pokhara city Tour. 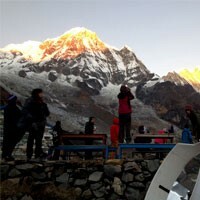 We drive to Sarangkot very early morning about an hour for the sunrise from where we see stunning Dhaulagiri, Annapurna, Manaslu, and Ganesh Himal massifs including a beautiful mountain Fishtail than drive back to the hotel. We have our breakfast at the hotel and leave for the Pokhara city tour. We visit the gorge of the Seti river, Bindhyawasini temple, Gupteshwor cave, and Devi's fall than drive back to the hotel. We may go for boating on Fewa lake in the afternoon. Overnight at the hotel. Day 08 : Drive back to Kathmandu. We again drive back to Kathmandu by a tourist bus as we have been taking the first drive to Pokhara in the morning. The bus stops a few times for a short bathroom, Breakfast, and the Lunch. After our long driving from Pokhara, We have farewell dinner with the company this evening. Overnight at the hotel. Day 09 : Departure to the international airport for our final departure. Frolic Adventure provides us with private transport to drop off us to the international airport for our final departure and say goodbye until our next visit to Nepal.